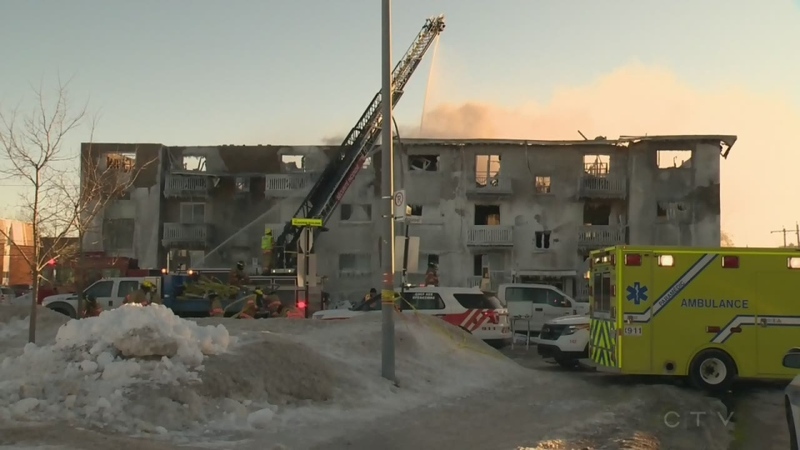 Donations are pouring in to help an orphaned boy and the dozens left homeless by a deadly apartment fire in Longueuil over the weekend. Non-profit group Carrefour Mousseau is collecting for the victims after the blaze ripped through a four-storey building on Toulouse St. at 1:15 a.m. Saturday. Janick Laroche lived in the building and lost everything. “It's like a nightmare. Literally, it's not real. It's like we're going to wake up some day and everything is going to be okay, but I know it's not,” he said. People jumped for their lives from upper balconies as firefighters rushed to rescue them. Laroche ran out of his home with only a few things he could carry. “Photos, videos from my kids when they were young, when they're born, our marriage, our wedding stuff -- everything is gone,” he said. Laroche, his wife and their two children were all safe; others were not so fortunate. Three people were killed: a couple in their 40s and the mother of one of them, a woman in her 60s. The couple’s child, a boy, aged 11 or 12, leapt from the third floor to safety. He was taken to hospital, as were 13 other people, to be treated for injuries including broken bones. The boy has autism and does not talk. He will be released into the care of other family members once he is well enough to leave hospital. "He's got members of his direct family who will take charge of him but we're going to make sure that he has all the resources and all the needs he has to have to make sure that his condition is at a top level," said Ghislain Vallieres of the Longueuil police department. “In my 20 years of policing, it’s one of the most dramatic scenes that I’ve seen,” he added. Police say the fire began in a basement apartment after someone left oil on a stove. The Red Cross is helping the 13 families affected, many of whom Vallieres said are first-generation Quebec residents and do not have family nearby to help them. “We're going to work with the municipality and with the city and with all the organizations to help them find a new lodging,” said Red Cross spokesperson Carl Boisvert. The housing office of Longueuil will help find new homes for the residents. What little was left of the building was demolished over the weekend, including the place Laroche called home for seven years. “We didn't recognize our apartment. Nothing is there. It's just trash,” he said. Flags are flying at half-mast in Longueuil to honour the victims. Longueuil Mayor Sylvie Parent said those wishing to make donations can call 3-1-1. Those calling from outside Longueuil can call 450-463-7311. Non-profit group Carrefour Mousseau is helping take in donations for victims of the fire.